ocean_1.ncl: Takes advantage of land being set the missing to plot the land as the mask used by the ocean model. If you were to plot T(0,20,:,:), you would see significantly more land. mpOutlineOn = False, Turns off the continental outline. 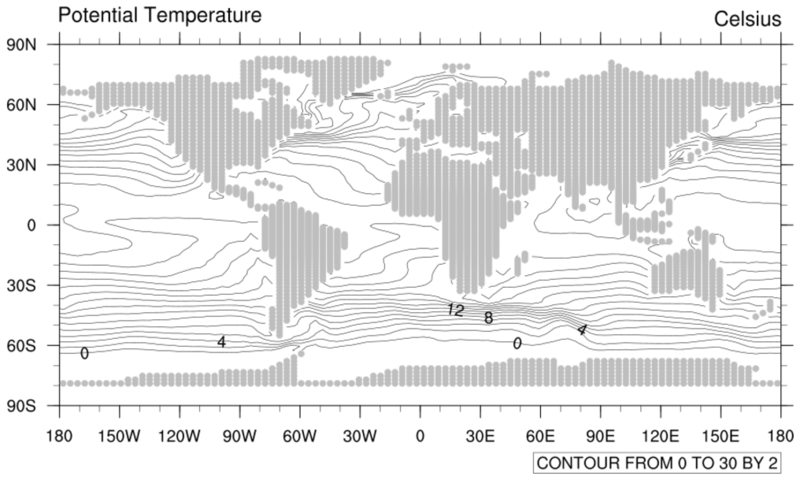 ocean_2.ncl: Plots contour lines and uses a polymarker to fill in the continental land mask based upon the rmask=0 value. Using rmask for the land mask works only for the surface. Chooses which rmask value to draw, reads in the rmask array. If the cyclic point is removed from the lon_t array, it must also be removed here. ndtooned converts a multi-dimensional array to a single dimension. ind returns the indexes of the input where it is True. inds = ind(ndtooned(rmask).eq.indexes) Uses the above two functions to pull out the indexes in a one-dimensional sense, where rmask equals land. ocean_3.ncl: Uses rmask and polymarkers to draw the masks for the different ocean areas. Chooses which basins to plot and in which color. Other named colors are available. 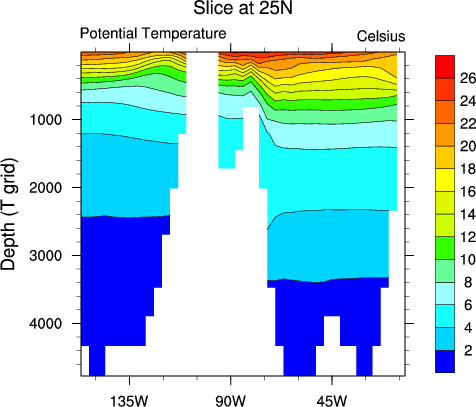 ocean_4.ncl: Plots an oceanic slice across the Atlantic at 25N with a default label bar. cnLineLabelsOn = False, Turns off contour line labels. cnInfoLabelOn = False, Turns off the contour information label. gsnYAxisIrregular2Linear = True, Converts the irregular z-axis to linear. trYReverse = True, Reverses the y-axis. pmLabelBarDisplayMode = "Always", Turns on the label bar when using gsn_contour. When using gsn_csm_contour, the label bar is the default. 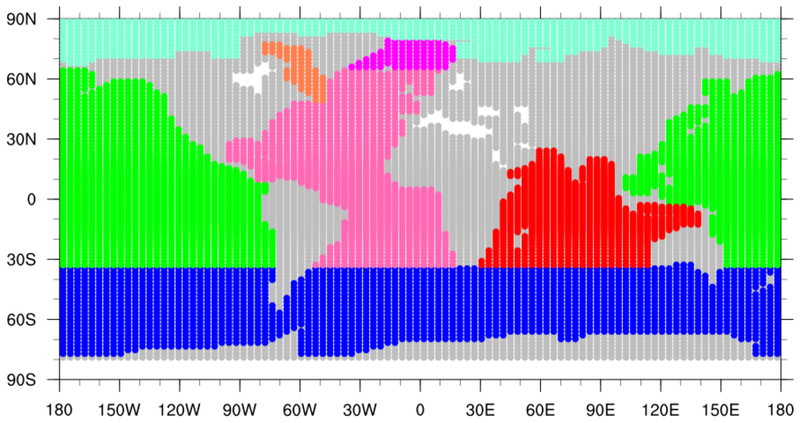 sfYArray = z_t/100, Uses the lon/depth arrays for the plot axis.